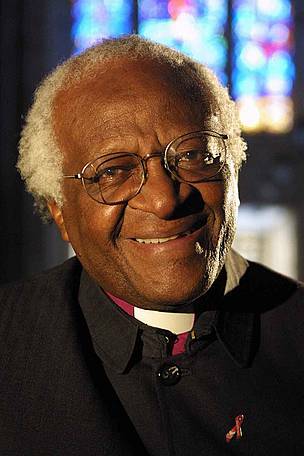 WWF marks 50 years of conservation but Archbishop Tutu warns greed threatens environmental progress. Zurich, April 29th 2011 - WWF, one of the world's leading environmental organisations marked fifty years of successful conservation but was reminded of bigger challenges to come. As WWF staff and supporters gathered in Zurich to celebrate their half-century, guest of honour Archbishop Desmond Tutu - a long-time champion of fair and sustainable development - warned we live in a world threatened by greed and consumerism. "Our desire to consume everything of value, to extract every precious stone, every drop of oil and every creature from the sea knows no bounds," said the Archbishop. "This quest for profit subverts our present and our future. There are too many people who are getting better and better at exploiting the environmental heritage which belongs to us all. We are not heading for an environmental disaster - we have already created one." "We are meant to live in a world which we share, and we are meant to live as members of one family," said Archbishop Tutu. "And yet whenever we look around, isn't it devastating to see the inequities and levels of poverty? Our population is increasing, environmental degradation is increasing. How do we resolve these inequities when all we are told is growth, growth, growth?" However the Archbishop sounded an optimistic note and said he believed humankind could learn to live within its limits. "There is enough for everyone - but not enough for our greed," he said. "There's enough for us all to live a full life - so why do we want to destroy the only home we have?" Since 1961, WWF has been instrumental in getting more than a billion hectares protected, several species brought back from the brink of extinction, and raising more than one billion dollars in conservation finance. The organisation is now supported by more than five million people and is active in over 100 countries on five continents. Swiss President Micheline Calmy-Rey highlighted WWF's record of achievements and said the organisation was vital in today's world. "The protection and sustainable use of natural resources is one of the most pressing issues today. Thanks to WWF we have learned we have to take a holistic approach to the environment," she said. "Addressing environmental issues at global as well as local levels becomes ever more important." Earlier, guests at the gala event in Zurich heard WWF International President Yolanda Kakabdse outline the advances made in conservation in the past half-century. "When WWF was founded there were no ministers of the environment and no environmental treaties. Today such ministries are found in governments worldwide, and treaties are increasingly used to govern and protect the environment," she said. "Right from the beginning, this organisation has been built by individuals with a deep and inspiring passion: a commitment to stop environmental degradation and build a future where people live in harmony with nature, " said Ms Kakabadse. She also joked that the Duke of Edinburgh - President Emeritus of WWF - would have been present were it not for a family wedding taking place in London. In a message Prince Philip said: "Perhaps its [WWF's] greatest achievement so far has been to make a significant number of people in all communities, in all parts of the world, aware of the serious threats facing the world's natural environment." Al-Jazeera anchor Veronica Pedrosa introduced a video-taped message from world-famous naturalist and broadcaster Sir David Attenborough in which he said conservation organisations such as WWF were becoming increasingly important as the planet faces greater challenges. "As WWF has pointed out, this is an issue for everybody because it affects everybody," said Sir David. "We are dependent on the natural world for everything we need. The job of WWF is more important than ever and it deserves all the support it can get." WWF International Director General Jim Leape reminded guests why they were there and of the work still to be done to achieve a fair and sustainable world for all. "The world would be much poorer today without our efforts, yet it is a cruel irony that, for all that we have accomplished together, somehow we have to find a way to do even more. We have to find a way to bend the curves that will define our future – carbon, water, fisheries, erosion of biodiversity; fraying of the fabric of life. We have to find a new way to forge connections with nature." "We live in an increasingly urbanised society that is largely ignorant of the wonders that inspire us. And we live in an economy that is still often stubbornly indifferent to the natural systems upon which it depends," said Mr Leape. Guests at the gala evening - which was held to say "thank-you" to staff and supporters world-wide - were treated to environmentally-themed theatre, dance, and musical performances, specially-commissioned art installations and a children's choir. WWF stressed that the costs of the event had been met by sponsors Chopard and Sarasin. WWF was founded in 1961 by a group of concerned naturalists and conservationists. WWF's 50th anniversary on 29th April 2011 marks the signing of the "Morges Manifesto", a document which led to the founding of the organisation and the first campaign to save endangered species. Since then WWF has grown into one of the world's largest and most respected independent conservation organisations, with more than 5 million supporters and a global network active in over 100 countries. El Arzobispo Desmond Tutu es uno de los grandes aliados de La Hora del Planeta.